The Voltage Tester PeakTech PKT 1090 is planned for ambitious requirements. The Voltage Tester provides a wide range of measurement functions. The Voltage Tester PeakTech PKT 1090 has CAT III 1000 V overvoltage theory. This Voltage Tester is suitable for industrial applications as well as in the daily maintenance and repair praxis. The display of the Voltage Tester PeakTech PKT 1090 is big and very high-contrast. By the backlight a work with the Voltage Tester is also guaranteed in low light conditions. By its rubber grip the Voltage Tester PeakTech PKT 1090 is enormously robust and ideal for the toughest applications in the electronic industry. By the unique test point lighting and the built-in flashlight it is possible to perform a reliable measurement in low light conditions. On the basis of the bar graph display at the Voltage Tester it is easy to visible in what dimension the tension moves. This ensures that one-hand operations can performed with the Voltage Tester on sockets. In addition the Voltage Tester PeakTech PKT 1090 provides a low impedance test function for residual current operated device. The Voltage Tester is an indispensable measurement tool for any craftsman, plumber, electrician. 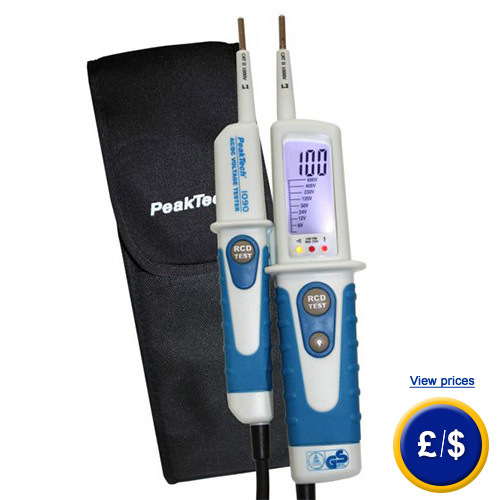 For further information about the Voltage Tester PeakTech PKT 1090, please read the following technical data or call our Hotline: UK customers +44(0) 23 809 870 30 / US customers +1-410-387-7703. You can also reach us through our contact form. Our engineers and technicians will gladly advise you regarding the Voltage Tester PeakTech PKT 1090 and all other products in terms of regulation and control, or scales and balances of PCE Instruments. V/DC: ±1,0 % from reading ±3 dgt. V/AC: ±1,5 % from reading ±5 dgt.